We are excited to introduce you to our truly comfortable “Villa' vacation rental. Located in the beautiful historic Gold Rush Town of Murphy's. Home of 23 tasting rooms all within walking distance of the Villa. Named 'One of the Top 10 Coolest Small Towns in America' by Frommer's, Murphy's is a truly unique and memorable destination. Called a sweeter Napa. Our tranquil property boasts 4 acres of pasture, vineyards, gardens including fruit trees, hot tub and a dipping pool to refresh from the summer heat. Big Trees Park, Bear Valley Ski Resort and beautiful lakes are only an easy 20 to 40 minutes drive away. The Villa is directly adjacent to Val du Vino Winery. Come and meet the owners, Jeannine (a French woman) and Jonathon (the winemaker), by stopping at the Winery. Such a great spot, on Main Street, but away from the crowd. 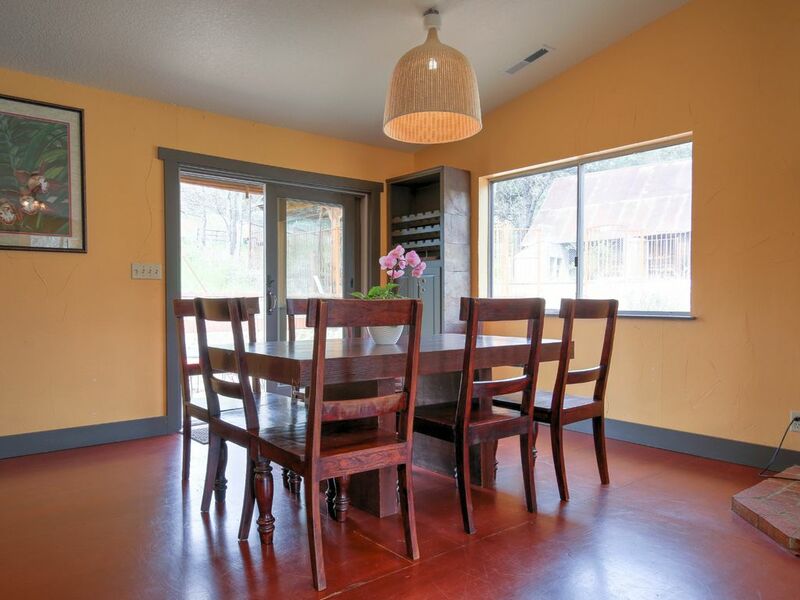 Plenty of parking, not squeezed between other homes, view of vineyards and pasture even cows. A true vacation with hot tub, dipping pool and basket ball court and much more. Enjoy enormous privacy, hot tub, pool, view of country side, winery, vineyards. Walk to 20 + tasting rooms. Four golf courses nearby. Skiing, rafting, hiking, lakes, rivers, fishing. Thank you so much we had the best time. Our hosts were more than gracious and the location was beautiful. We will be back! This place was perfect for our group. Love that for 3 couples, everyone has their own bathroom. The house was well equipped with all the necessities and check-in/check-out process was a breeze. The hot tub was clean and enjoyable. The best part was being able to walk to all of the tasting rooms & restaurants. Would definitely stay here again! Thanks for having us! So glad to hear that you enjoyed your stay and the the villa fit you needs. Hope to see you all back in Murphys in the near future. Perfectly located, beautiful home, well-supplied, great for our family vacation. Loved it! Thanks! Thank you so much Jeannine and Jonathon for a wonderful stay! The villa was perfect for me and my guests. Hope to see you soon! We had a wonderful time at the Villa. The open floor plan was great for our family to interact, even while the "chefs" were cooking in the well equipped kitchen. The hot tub was a treat. The master bedroom has a large walk in closet, which served as our grandson's bedroom. It was perfect for his pack-and-play bed. The location can't be beat, as we walked to town in a few minutes. The Val du Vino winery has very good wines, too! Thanks for sharing your house for our 3- families get-away! We stayed at the property for a wedding at the Murphy’s Inn and the location was perfect. Great kitchen and worked well for our family. ** Skiing. The Villa is only 40 minutes to Bear Valley Ski Resort** You will not have to dig your car out of the snow! !